aïr 600LS, the most impressive lift & slide door has been named a finalist for Best Glazed Doors in the 2018 Build It Awards. 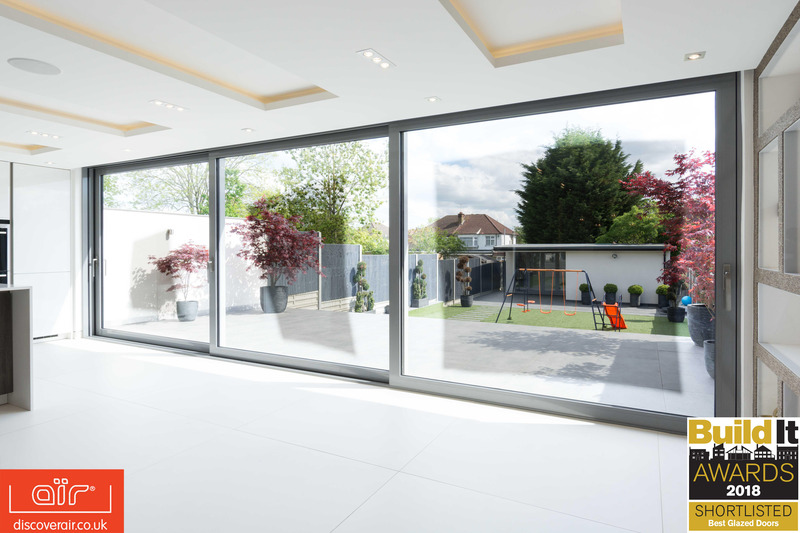 As the flagship product for the aïr range of premium domestic aluminium doors, aïr 600LS offers homeowners slimmer sightlines and wider glazed areas, perfect for creating light-filled spaces that perfectly merge the home and garden. Manufactured exclusively by Everglade Windows and installed in homes across the South East by its exclusive network of Accredited Retailers, aïr 600LS offers captivating design and extreme engineering. The aluminium glazed lift & slide doors are specially designed for wide-openings. The system is available with configurations up to 6 panels and each glazed panel can measure up to 2500mm wide and 2700mm high. Jay Patel, aïr Brand Ambassador says: “We’re so pleased to be shortlisted for this award. aïr 600LS is a really popular product with homeowners, self-builders and renovators who want a door that adds another dimension to their home improvements. aïr doors are available with the police-approved Secured by Design accreditation, fitted with the 3-star Sold Secure Diamond Ultion cylinder and are backed by an industry leading 25-year guarantee. The winners will be announced at the Build It Gala Dinner on 9 November 2018 at the Hilton Bankside in London.